Chinese Ambassador Sun Yuxi raised a political storm in New Delhi by reiterating China's claim to Arunachal Pradesh on the eve of president Hu Jintao's visit to India. Here's a quick look at what the border problem is all about, and how it affects Sino-Indian relations. The essential dispute is over China's refusal to acknowledge the McMohan Line as the border between the two nations, and staking claim to large tracts of land as a contiguous part of Tibet. In the late 1950s, soon after occupying Tibet, China occupied a large tract (approximately 38,000 square km) of Aksai Chin, a remote part of Ladakh in Jammu and Kashmir bordering Pakistan, and built a highway (National Highway 219) through it to connect with its eastern province of Xinjiang. India considers this an illegal occupation. In the middle, or southern part of Tibet, China asserts that the border dividing Tibet and Sikkim and Uttar Pradesh are also disputed. And in the east, it lays claim to the entire state of Arunachal Pradesh. What is the Tawang issue? 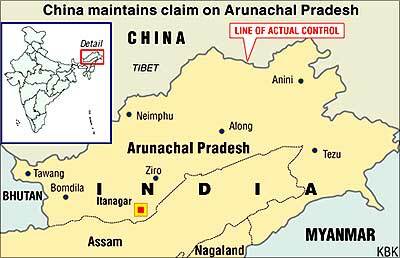 While China officially stakes claim to all of Arunachal Pradesh, it is a small district called Tawang, which borders Tibet and Bhutan, which it is most interested in. The town is famous for its monastery, built in 1681 by the by the Tibetan Lama Lodre Gyatso in accordance to the wishes of the 5th Dalai Lama, Nagwang Lobsang Gyatso. China cites the monastery as evidence that the district once belonged to Tibet and wants New Delhi to return it in order to help settle the row. "We don't recognise the entire Arunachal state as being a part of India," a Tibet wire service quoted a senior Chinese diplomat as saying, "But Tawang is particularly special. It has longstanding historic links with Tibet and it is important for us to be able to settle the border problem." What is the McMohan Line? When the new Republic of China was formed in February 1912 after the abdication of the Qing emperor, the Tibetans asserted their independence, and forced the Chinese troops based in Lhasa to return to the mainland-via India. A year later, Tibet declared Independence from China. In order to ensure that the unrest did not spread to India and assert their boundaries, the ruling British convened a tripartite meeting at Shimla with Tibetan and Chinese delegates to negotiate a treaty defining the border, among other things. The accord gave China suzerainty over most of Tibet, and the boundary defined in this treaty was later known as the McMohan line. The British, and subsequently the Government of India, saw this as the official border with Tibet. But while the 1914 treaty was initialed by the three parties, Beijing later reneged, saying the 'provincial government' of Tibet had no right to sign such an accord. It then went on to stake claim to huge areas of land surrounding Tibet, including Aksai Chin in the west and Arunachal Pradesh in the east. Also see: Who is Hu Jintao?